"This is the greatest thing in the world right now." 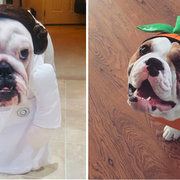 Sure, there is no shortage of cute and clever outfits for pets to put on in celebration of Halloween (if they're up for it, of course). But while it’s one thing to wear a costume, it’s another thing entirely to actually be the costume. Just ask this adorable pup named Keki — aka "Mop Dog." The sweet puli, a Hungarian livestock dog known for their long, curly locks, was a standout among costumed canines at last Sunday's MainStrasse Paw-Rade in Covington, Kentucky. It wasn't a contest, per se, but she more than "cleaned up" in the praise department. "This is the greatest thing in the world right now," Twitter user Darth wrote. Capturing the essence of that ubiquitous floor-cleaning implement is no easy task. Well, except for Keki. 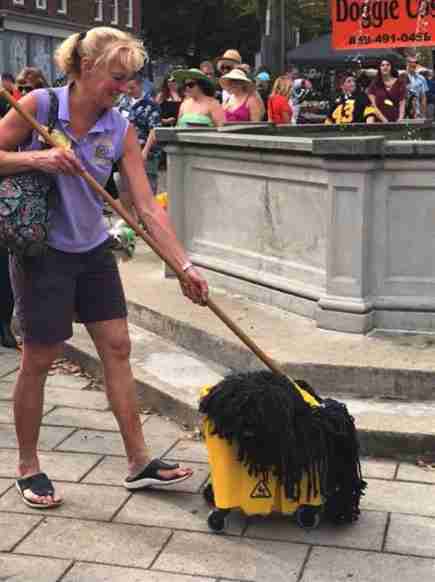 The best thing about her "Mop Dog" costume is the leisurely way she got to parade it about. Rather than waddle around in some more cumbersome costume (I’m looking at you, “Hot Dog Dachshund”), Keki simply got to sit back and relax, nudged along by her owner, as throngs of her newly-adoring fans passed by. "[She] loved the attention and petting she received," a source close to Keki told The Dodo. Someone on Twitter even wrote a poem inspired by Keki's costume. If only summoning a personal visit from "Mop Dog" were as easy as falling in love with her. After all, the floors of our hearts could always use a nice scrub from such a good pup.